Some promote natural gas as a clean fuel for transportation that can solve both the climate change and energy security crises, but a paper released yesterday in Climate News casts doubt on that direction. Some have proposed Natural Gas to be used as a supposedly clean "bridge fuel" to address both climate change and national energy security concerns. However recent research, published in Climate News, by a team led by Robert Howarth, Renee Santoro, and Anthony Ingraffea of Cornell Univ, casts a shadow of doubt on this proposal due to methane leakage, not to mention the controversy over hydraulic fracturing that has enabled the natural gas boom to exist in the first place. While natural gas is, well, a gas, and frequently used for generating electricity and heating, it can be used as a transportation fuel if compressed (CNG) or liquified (LNG). Many see natural gas as clean, but that's when compared against coal. For transportation fuels the primary advantage of natural gas is that it's a domestic fuel available widely inside the U.S. due do the rapid growth of hydraulic fracturing. Primarily transportation fuels in the U.S. come from fossil oil imported from other countries. Because the U.S. passed its peak of oil production in 1971, it's not possible to make a meaningful increase in domestic oil production. Even if U.S. domestic oil production could be meaningfully increased, it would come at the cost of environmental and climate degradation. This means the U.S. is stuck with a transportation fleet utterly dependent on foreign fossil oil, sending vast reams of money to foreign countries to buy that fossil oil, no meaningful way to increase domestic fossil oil production, and some prominent voices suggesting natural gas is both clean, abundant and domestic. Natural gas and methane are essentially the same, chemically speaking. Methane, which is a far more powerful greenhouse gas than carbon dioxide, occurs naturally in various contexts such as decomposing biological material, from landfills, and is also released during hydraulic fracturing operations. A few years ago Natural Gas supplies were seen to be extremely tight with the peak of natural gas production right around the corner and a decline in natural gas production would have set in by now, if it were not for hydraulic fracturing. The hydraulic fracturing process involves pumping water laced with various chemicals underground to fracture the rocks, and cause chemical reactions, resulting in a release of methane. That methane is meant to be captured and sold on the market as natural gas. However, many blame hydraulic fracturing with polluting groundwater, and in any case Howarth's team showed that not all is rosy perfect with this scenario. The advantage of burning methane or natural gas is that, in addition to operating a machine or making heat, the methane is converted into carbon dioxide. While carbon dioxide is still a greenhouse gas, it is less potent than methane. Hence it can be argued that if the methane already exists, burning it makes it less harmful while producing a benefit. Compressed natural gas (CNG) is widely used as a transportation fuel but in specific niches such as city bus systems. With that basic understanding out of the way, let's turn to the study. Robert W. Howarth, Cornell University, said: "We believe the preponderance of evidence indicates shale gas has a larger greenhouse gas footprint than conventional gas, considered over any time scale. The greenhouse gas footprint of shale gas also exceeds that of oil or coal when considered at decadal time scales, no matter how the gas is used. We stand by the conclusion of our 2011 research: 'The large [greenhouse gas] footprint of shale gas undercuts the logic of its use as a bridging fuel over coming decades, if the goal is to reduce global warming.'" The team published yesterday, in Climate News, a rebuttal to criticism they received after their groundbreaking April 2011 paper. The new paper, titled "Venting and Leaking of Methane from Shale Gas Development: Response to Cathles et al." is the "first comprehensive analysis of greenhouse gas emissions from shale gas obtained by hydraulic fracturing, with a focus on methane emissions." The core of the Howarth team's argument is methane leakage during mining of natural gas from hydraulically fractured shale formations, as well as leakage in the distribution and transportation infrastructure. Remember that methane when burned converts from a potent greenhouse gas, to the less potent carbon dioxide. But methane leaking out of pipes is still methane, and is a highly potent greenhouse gas. What Howarth's team has done is create a comprehensive estimate of the methane leakages. Following a hydraulic fracturing process methane leaks out of the well before the well can be capped. Howarth's team notes an EPA report documenting that methane emissions from the well during hydraulic fracturing cleanup are simply vented to the atmosphere, in other words adding to the greenhouse gas footprint. Natural gas pipelines are sometimes leaky, due to the age of the pipeline infrastructure. The average long distance gas transmission pipeline is over 50 years old, and in some cities the natural gas infrastructure is 80-100 years old. Overwhelmingly the pipelines are made of steel, and steel rusts. An example of this problem is the pipeline explosion in San Bruno CA (just south of San Francisco) a couple years ago which has been attributed to aging natural gas pipelines that were incorrectly manufactured in the first place. 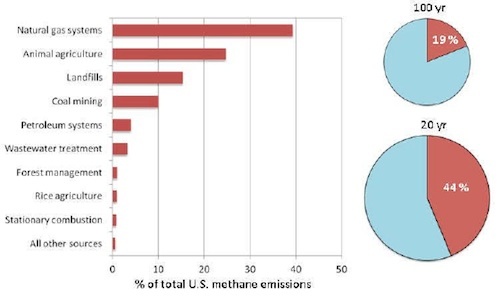 From these factors and more Howarth's team calculated that the natural gas industry accounts for 39 percent of the U.S. total methane emissions. The natural gas industry already accounts for 17 percent of U.S. greenhouse gas emissions, and this is expected to grow to 23 percent as shale gas production expands. The paper concludes these two problems can be fixed. First the EPA has proposed regulations to capture methane leaking from shale gas wells. Secondly, the methane leaking from the aging infrastructure can be addressed by rebuilding the U.S. natural gas pipeline infrastructure. However, this will be extremely expensive to accomplish and the paper asks this highly relevant question: "Should society invest massive capital in such improvements for a bridge fuel that is to be used for only 20 to 30 years, or would the capital be better spent on constructing a smart electric grid and other technologies that move towards a truly green energy future?" During fracturing operation there is no chemical reaction. Any chemicals added to the frac water is to reduce friction and carry the propping agent such as sand, glass beads or in some cases ground walnut hulls into the formation. These propping agent are deposited in the shale formations and alow the gas to move and flow toward the production well. The water and chemicals are then allowed to flow back out of the formation and back into the well bore and then into the frac tank containers the water was in before the frac operation started. The propping agents are left in the formation to allow the free flow of natural gas to the well bore. Many of the fracking fluids have been improved to prevent contamination even if spilled at the frac site and are totally biodegradable. I have a minor complaint. I am sure your article is accurate, however, some phrases and terms are being repeated that seem to put a negative slant on hydraulic fracturing. You stated, "...water laced with various chemicals..." 1. Why did you choose the term "laced"? This term has only a negative connotation. 2. I would like to clarify and remind readers that water is a chemical. To state that "various chemicals" are used seems to be an intentional accusation that HARMFUL or TOXIC chemicals are used. Viscosifying agents (thickeners) are used in frac fluids. Most are the same thickeners used in food products. Grab the closest "junk" food wrapper and look for "guar gum" or "xanthan gum" and you may realize that the food we eat is also "laced with various chemicals". To be clear, these two examples are harmless food grade products. 110% Spot On. While there have been some issues in the US re this process, most relate to projects carried out ages ago. The process has improved light years and you could nearly drink the stuff used now (but it would taste disgusting!). I'm all for doing things safely, carefully and responsibly. Let's look at the process rationally and logically, and leav the hysterical behind. The existing fleet of heavy, reciprocating piston engines, calibrated to burn hydrocarbon fuels, is an investment with no future. To pursue hydraulic fracking, putting groundwater at risk, for minimal displacement of imported hydrocarbons, is futile. The US currently consumes over 20 million barrels of oil a day; and we are contribute 25% of the global warming problem. These two facts mean that expensive domestic oil will never replace a significant amount of domestic consumption. The US should pursue sustainable, efficient, and large scale technological solutions to the problem of energy use and transportation, an investment in technology that will make us the leader in the 21st century, providing solutions and alternatives. Our failure to do so is caused in part by the fact that we have invested heavily in old, obsolete technology (the modern automobile is not much different, fundamentally, from the designs of the 1920s.) We can continue moving heaven and earth to sustain the unsustainable, and deny the future a chance to thrive, or foolishly squander opportunity while saddling the future with the debts of today. I gave up 99% of my driving three years ago, lost 50 pounds and manage to do it all on a $50 bicycle. When the future comes and your grandkids ask why the climate is messed up and the water table is polluted, will they ask if you had fun driving to and from the store? Were you fat and warm and comfortable? Or will they ask why you polluted their planet, and handed their future over to China and India while you blew the tops off mountains and drilled into the ground? So to sum up, no, we should not invest in foolish "bridge fuels" that will not produce meaningful value for future generations, only costs. It is a short-sighted and selfish thing to do. If we do not pursue marginal shale oil, we will be proud we didn't lay waste to the landscape and water table in the future, and we will be happy that our kids don't string us up by our necks for the damage we did to their world. Any article with 'fracking' or 'shale gas' in it will automatically attract a virtual army of apologists. Strange that there's so many people out there who just happen to have nothing better to do than spread misinformation about fracking. Some 'minor' problems in the past, guess the paid trolls aren't told to talk about the direct link found to earthquakes, the death of animals and the poisoning of aquifers and groundwater. Yeah, I suppose Cheney inserted the Haliburton Loophole into the 2005 Energy Act to exempt gas companies from the Clean Water Act because of guar gum in the frack water. Nothing to do with the hundreds of carcinogenic chemicals (yeah, a little worse than that dangerous water chemical). I think I'd use the word 'laced' too. Trolls are the scourge of the 21st century. I'd encourage anyone to view pictures of the oil sands operation in Alberta to imagine what a full-scale effort to convert Pennsylvania and New England into another Saudi Arabia. We have just enough oil in the ground to run the modern economy for one generation, after which the climate will be permanently altered and our children impoverished in the country our great-grandfathers built. We have built a disastrous bar-centric civic infrastructure that should be dismantled before it does irreversible harm to the planet. I'm afraid the automobile has become the ultimate Faustian bargain. This generation is consuming and ultimately wasting more energy in one generation than every generation going back 200,000 years. Cars are simply "assisted mobility devices" and their dependent owners are rapidly entering their twilight years, where they will require "mobility scooters", making them the first generation in history that was completely transported around by chemical energy... and their bodies show it. The Alberta Tar Sands are a surface or near surface field that is thick tar that is accessible from the surface from anyone with a big enough shovel. Hydraulic Fracturing involves creating fractures many thousands of feet under ground. Not the same thing. The problems with the Tar sands are the waste of energy required to heat up and extract the Oil. Also I wouldn't argue that it is environmentally insensitive. With very few exceptions Hydraulic Fracturing is completely safe, with thousands of wells drilled every year and less than a handful of problems over the last 5 years. There are three objectives in moving to new sources of energy for transportation from the petroleum dependece we have today. They are 1. criteria emissions, 2. global warming and 3. domestic production. Ask yourself which of these is the largest and nearest term problem: Are you going to choke on dirty air, roast yourself and the planet through the green house effect, or suffer continuing economic ruin and engage in foreign wars to protect your oil supplies? I would submit it is the latter and that natural gas is the ONLY alternative that has the scale and cost effectiveness to work. Electric vehicles are far too expensive and there is not even a "line of sight" to sufficient battery capacity to allow practical range under real world (read; hot and cold, I would like to have a/c and heat) driving conditions. Natural gas can contribute immediately to cleaning up the electrical grid by moving us away from coal and it can be very effectively used in transpotation - especially for higher fuel use trucks. We need to stop the silly attacks on hydraulic fracturing and gas leaks - there are no other near term solutions (if there are issues - fix them - we have the technology, and it is not complicated). We would all be a lot better off if we agreed to move to domestic natural gas as fast as possible and to make it work. People who suggest gas leaks cause global warming and therefore we should not move to it are essentially perpetuationg the status quo and our associated petroleum dependence - It's sad and shows a complete lack of a big-picture perspective.